Jalilifar, A., Banari, R., Shooshtari, Z. (2019). Exploring the Patterns of Evaluative Language in Physics Blurbs: The Appraisal Strategies in Focus. International Journal of Society, Culture & Language, 7(1), 1-15. Alireza Jalilifar; Reza Banari; Zohreh Gooniband Shooshtari. "Exploring the Patterns of Evaluative Language in Physics Blurbs: The Appraisal Strategies in Focus". 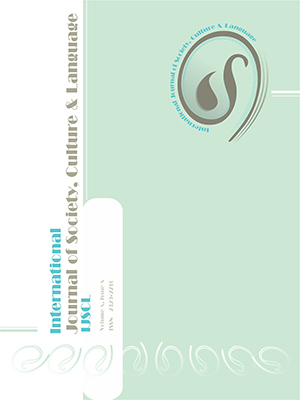 International Journal of Society, Culture & Language, 7, 1, 2019, 1-15. Jalilifar, A., Banari, R., Shooshtari, Z. (2019). 'Exploring the Patterns of Evaluative Language in Physics Blurbs: The Appraisal Strategies in Focus', International Journal of Society, Culture & Language, 7(1), pp. 1-15. Jalilifar, A., Banari, R., Shooshtari, Z. Exploring the Patterns of Evaluative Language in Physics Blurbs: The Appraisal Strategies in Focus. International Journal of Society, Culture & Language, 2019; 7(1): 1-15. The current study qualitatively examined blurbs in the discipline of physics which is perceived to be less infused with evaluative resources and more objective and impersonal in its textual argumentation. The study followed the appraisal framework proposed by Martin and White (2005) to see how interpersonal meaning is textually constructed in blurbs. Findings indicated that writers of the blurbs are more favorably disposed towards employing appreciation than other kinds of attitudinal resources. Two major waves of interpersonal meanings were observed in the hyper-Theme and hyper-New of blurbs. The latter appeared stronger because of the interpersonal contributory effect of the former. Findings showed that the ideational entity receiving initial thematic prominence in the beginning phase of the blurbs is the book rather than the author, leading to the major prominence given to the book, the dense accumulation of appreciation in comparison to other attitudinal resources, the grammatical passivity of blurbs’ structures, and the realization of blurbs’ discourse as a marked theme.